Cormac McCarthy's Pulitzer Prize-winning novel The Road was published in 2006 but it's taken me eight years to get round to reading it. Given that I particularly like dystopian, post-apocalyptic fiction, this is surprising. I suspect that, subconsciously, I was just scared to read it because I suspected it would be unrelentingly bleak. And bleak it certainly is. The opening lines talk of 'Nights dark beyond darkness and days more gray each one than what had gone before. Like the onset of some cold glaucoma dimming away the world.' That pretty much sets the underlying tone. The Road tells the story of an unnamed man and an unnamed boy, making their way through a decaying, barren, ash-strewn landscape in the wake of some terrible, unspecified disaster. The eco-system has been completely destroyed; there is no wildlife, no vegetation, and so little sunshine that the father fears his son will succumb to rickets. There are very few people left - the man and his son frequently come across long-dead human remains - and those human beings that have survived have resorted to unspeakable savagery, including cannibalism, to survive. The man and the boy are, as the man often reassures his son, 'the good guys' who are 'carrying the fire'. What isn't clear is whether they might be the only good guys left alive. With them they have an old shopping trolley stuffed with meagre possessions. The man is suffering from a lung complaint and coughs blood when his son isn't looking. Their only food supplies are tins scavenged from abandoned houses and shops; they are often starving. The only fresh food they consume throughout the entire novel are some mushrooms that have managed to grow in the ash. It says everything about their condition that their most valuable and prized possession is a pistol with two live cartridges, reserved for the all too likely event that they will be caught, for food, by others. The Road is exquisitely written, and there are times when the experience of reading it is like reading an extended poem. The grim lyricism of the descriptions are in direct contrast to the short, stark but touching and revealing exchanges of dialogue between the man and his son, whose relationship is one of the most movingly portrayed I've seen in fiction, a single speck of tender purity in a brutal, decaying world. 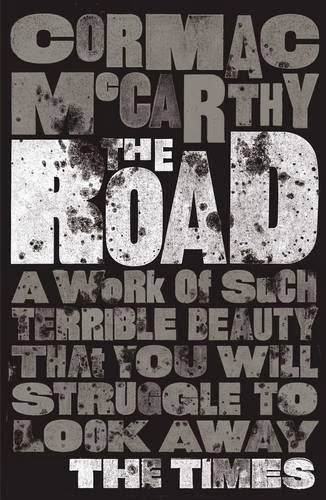 The cover of The Road promises that it is 'a work of such terrible beauty that you will struggle to look away'. I can't argue with that. I would be hard-pushed to say that I 'enjoyed' The Road - it's among the most harrowing, desolate books I've ever known - but at the same time, I feel glad that I've read it.